Heuchera are wonderful border plants, growing tough and tolerant of extreme weather conditions such as heat, cold, humid, drought etc. They grow short in height and provide radiating foliage colours throughout the year. Obsidian is a new variety that looks excellent in front of borders and in garden containers. It features purple-black foliage that is simply exquisite in appearance. Obsidian from the Heuchera genus, is a herbaceous perennial with jet black to purple rounded and lobed leaves, slightly ruffled at the edge. The leaves are dark black and retain purple hints that look stunning on a bright sunny day. In summer, it blooms small white flowers on tall panicles that attract bees and butterflies. The obsidian plant derives its name from a volcanic gem called Obsidian. Its richly coloured foliage adds highly ornamental value to any garden. Heuchera Obsidian is also known as the Coral Bell plant. Plant it in shady areas or in full sun. It will brighten up dull corners in the garden. It can adapt to any soil that is moist, fertile and regularly drained. 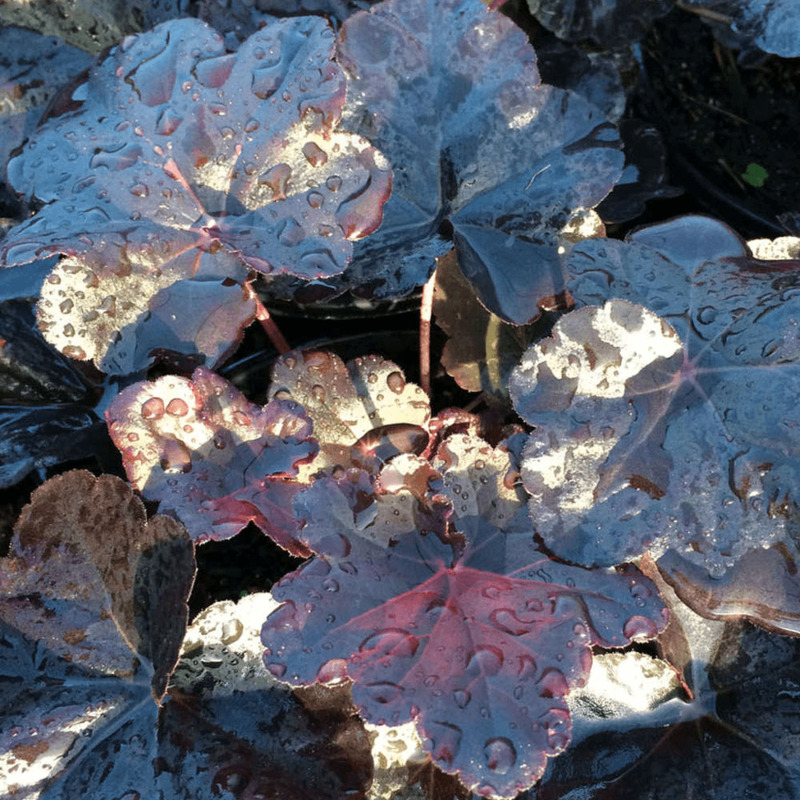 Heuchera can tolerate some wet soil but not water-logged ones. Obsidian thrives even in exposed windy location, making it suitable for coastal gardens. It is an easy to grow plant that requires low maintenance and gardening experience. Coral Bell Obsidian does not demand a lot of pruning either. Simply remove or trim any damaged leaves in spring. Water the plant moderately in dry periods. Heuchera Obsidian looks stunning when grouped together in a mixed border. Their perfect mounding habit allows them to sit tight in garden containers. It can also be used as ground cover under taller shrubs or trees.